Welcome to 247 Klondike.com, a smorgasbord of all things Klondike Solitaire! Stimulating and best of all free(!) 24/7 Games Klondike Solitaire games are always available for your playing pleasure. Play One Card Klondike Solitaire as often as you like and always be improving your Klondike Solitaire skills! Keep track of your ever increasing solitaire accomplishments online as 247 Klondike.com will automatically record your high score! Play Klondike Solitaire by making stacks of cards, stacks will cascade towards the bottom of the solitaire board and are to be comprised of red, black, red, black, red, black cards. 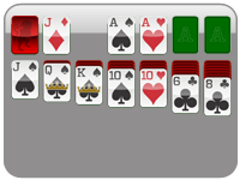 Players of Klondike Solitaire can click on their reserve cards at the top left hand of the solitaire board for more card options. The stock card pile will deal solitaire players only one card at a time though players are allowed unlimited passes through the deck! You will have won Klondike Solitaire when all of the cards have been added to the four foundations. Cards must be placed in the foundations from Ace all the way through King. Klondike Solitaire is a solitaire fan favorite, this free online solitaire game provides fluid solitaire fun for the whole world! 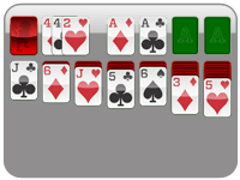 Plus, if you ever have a solitaire snafu the undo button is just a click away! 247 Klondike.com games are fun and free, suitable for players of all ages! Fill each of the four foundations at the top right of the game and will Klondike Solitaire!